The Powerwerks PW50 Portable PA System stands out as much for the price tag as the specification. Some portable PAs pack a punch and offer a lot of different features, but come at a high price. This model is affordable enough that teens and budding musicians can pick one up as their first PA system. This 50W sound system has a three channel mixer, high and low EQ and twin 4.5’’ drivers. But, is this really enough? Is There More To The Powerwerks PW100T All-In-One PA System Than The Price Tag Suggests? 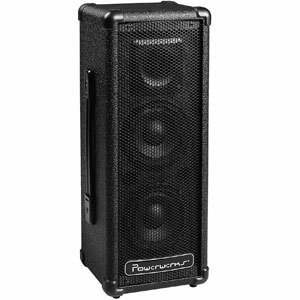 A simple, all-in-one PA sound system like the Powerwerks PW100T PA System is a must for musicians, speakers and other professionals looking for a convenient way to add volume to their performance as they travel from show to show but the price tag of this particular model has led to some low expectations on sound quality and options. It claims to have four 4.5” drivers, a wide range of inputs, channels and outputs, a high and low EQ and a built-in stand-mount adaptor, but is this enough?